Save money on all your tent and party rentals! 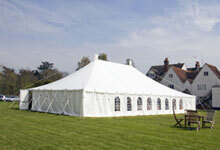 All Island Party Tent Rentals has a variety of sizes of tents to fit your needs. From a small birthday event to a large wedding, we can keep your guests cool and comfortable. Our tents can withstand any rain or wind. Take a look at our tent sizes. *Must be set up on grass. Great for decks and patios!